To book the Trelawny Singers for an event please contact Malcolm Brown (e-mail: mal.b39@btinternet.com or phone: 01736 364584) to discuss your requirements. The Trelawny Singers are happy to accept bookings to give traditional Concerts as well as to sing at Fund Raising Events, Weddings and Church Services. Please note that the Trelawny Singers charge a small fee to cover travelling expenses. 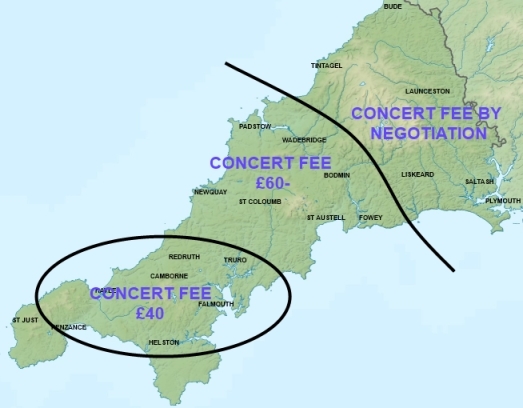 The diagram below gives an indication as to the fees charged. Please note that all monies raised by the group are solely for charity as the singing members give their time freely.